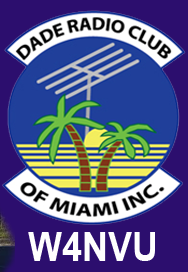 April 2013 Meeting Minutes – W4NVU – Dade Radio Club of Miami Inc.
Meeting was called to order at 19:30 with 40 present. We have a quorum. Miguel presided over the meeting and welcomed everyone. The meeting was not broadcast live on the air tonight from the EOC. There was testing being conducted in another room tonight. Everyone took turns and stated their name and call sign. Miguel welcomed everyone again. Miguel reminded everyone present tonight to sign in. Miguel announced that we have a guest tonight from BrowardCounty – Mickey Baker and he will speak to us about D-Star later in the meeting. Miguel announced that we were having a raffle tonight of a 50’ coax cable. One ticket for $1.00 and 3 tickets for $2.00. The minutes for last month were posted on the website. Miguel asked if there were any objections to the minutes as posted on the website. There were none. The minutes are accepted as posted. Corresponding Secretary – Lloyd advised that the PO Box is empty. Treasurer – Ester advised that we have 41 paid members. There are no changes in our funds. We are back to where we were before the Hamfest. Merritt gave her a check that was returned to the club. Membership dues are due. Please see Ester. Club Elmer/PIO – Frank is not present tonight tonight. Elections – Carl announced that for President we have Robert Cruz and Miguel Garrate; for Vice President we only have Julio Herrera; Corresponding Secretary – Lloyd Kurtzman, Recording Secretary – Joanne Carbana and Treasurer – Esther Sanchez – will all stay the same. Ballots were passed out by Carl. He will collect the ballots and advise the outcome later in the meeting. 147.000 – Merritt advised that it is not working yet. He is working on it and making progress. 147.760 – Ray is not present tonight. 224.200 UM – Is down. 1291.80 UM – Is down. 51.660 UM – Ray is not present tonight. 444.200 – Merritt advised that the switch was turned off and he turned it back on. It was working again and then went off. He will check is out again. No other repeater reports were given. Miguel stated that the Hamfest will take place next year on January 31 – February 1, 2014. We have been approved as a convention. The hours for Friday will be 12 Noon to 6 PM; and Saturday from 9 AM – 5 PM. Take-down will be Saturday evening. April 15 is the first Hamfest meeting here at the EOC at 7 PM. Emergency Management Committee Carl announced that in June classes will be held for Hams during the day on fire dispatch so that we can see how it works. Andy will be the instructor and it will take place in the back building in the training room. It will also be open to the public and emergency personnel throughout the state. We will also be giving tech classes. We will have the use of the building on Saturdays for Armando to run his classes too. The class will be 4 hours – TBA. He is looking into grants to obtain vests that we can wear for emergencies, and at events that we volunteer at. Classes for Tech rating are tentatively scheduled for April 27, May 5 and May 11. The test will be given after lunch on May 11. Frank gave a D-Star update. We need supporting equipment. It was discussed if the club will purchase more equipment at this time. We have a site at JMH. Carl suggested that we put together an estimate for the total and costs and we can vote on it. Mickey gave his presentation on D-Star that is up and running in Fort Lauderdale. It was very informative. Their antenna is on the AutoNationBuilding. His total costs were $800.00 and is only UHF. He has 22 new radio operators on D-Star in his area. You can jump on the internet from anywhere. Carl then suggested that we start with the UHF and build on it. Other members spoke about equipment and had questions about who would be using the system and if it would be worth it. Don advised that the weather service will use it. The hospital gave us the site and they will use it too. After more discussion, Fernando made a motion to allow the maximum of $1,000.00 for the purchase of a VHF duplexer, seconded by Carl. A vote was taken and it passes. There were 2 nays. Miguel asked if there was any other old business. There was none. Vice President – Julio Hererra was affirmed. President – Miguel Garrate was elected with 18 votes; Robert Cruz received 8 votes. Armando gave us a presentation on Raspberry pi. A single board computer the size of a credit card. He had one there for us to see. It uses a SD card. There is no hard drive. It runs about $35.00. It was a great presentation and very informative. The website for more information is: http//www.raspberrypi.org or see Armando. Julio announced that he was contacted by a family member of an old Ham that found old Ham equipment under the house. The equipment was donated to us. We are going to see what we can use and the balance will go to a military equipment display near the zoo. Dave came in from testing. We have 2 new techs – Otto Espino and Enrique Calixto. Cesar Rodriguez; Nelson Garcia, and Guawgqiang Zhao all passed their General. Rene Borroto upgraded to Extra. Congratulations to all! David spoke about the MS 150 Breakaway taking place April 20-21, 2013. He needs volunteers. See David if you are interested after the meeting. Miguel announced that we will join the Everglades Club for field day this year. Julio will provide more information at the next meeting. It would be June 22/23, 2013. Mickey announced that there will be a free flea this Saturday at Harris in Oakland Park. Don announced that UM is having a free flea in the weekend of April 21st too. Eddie Plummer won the raffle of the 50’ coax cable. Congratulations! Miguel asked if there was any other new business. There was none. Miguel thanked everyone for coming. The DRC meeting was adjourned at 20:10.